Meart The semi living Artist, by SymbioticA Research group in collaboration with the Potter Lab. Today, we seem to find ourselves in a culture that defines itself more and more through the filters imposed by its technology. While this is certainly not a new phenomenon, it does seem to take on a new significance in this the �biotech century�1 . The mixture of genetic and computer codes, of silicon and flesh, of network and biological structures, are giving rise to new ideas about the relationship between our bodies and our technologies - one where data flows freely between the two, managed by separate yet interwoven protocols. Hence, a different notion of the biological is emerging, one that while different, can still be fully recognized as something one would call �biological�. This essay presents an analytic perspective and examination on this phenomenon, one where the body is more and more becoming a site of new engagements. Where biological and information technologies meet. Where the �wet� lab and the �dry� lab coexist. What is presented here are not deterministic notions and predictions of a future with hybridized �post-human� machine-body cyborgs or clich�s of how biotechnology is changing what it means to be human (although it is). Rather, it examines how biological research and technologies such as genome databases, DNA chips, DNA computers and tissue culturing, along with the rise of networks and network protocols, are forcing us to reexamine what exactly constitutes the biological, what is life, what exactly is a body and what is its relationship to technology and to culture. It is an attempt to shed light and increase understanding, not only of the ways in which technology influences the biological, that is perhaps intuitively apparent, but also (and perhaps more importantly) ways in which the biological can influence the technological, and ways in which they all influence institutional power and control2. How can the complex and evolving layers of relationships between these fields be better understood? I propose that by examining the work of various artists/researchers in the field broadly referred to as �bio art� we can ascertain perhaps the best critique and understanding of these issues. Their work is a look into questions of the social impact surrounding the emergence of a world where the biological and the informational are each enhanced and informed by the other - where life is code, and body is protocol. Thus, the database becomes more than just a neutral technical tool. It has the potential to organize and standardize culture according its own internal operating logic. It becomes a potent force, influencing how a society perceives and defines itself, perhaps to the point where there is no cultural view apart from that which the database, and technology in general, bring forth. In the world of biotechnology, database logic can shape the boundaries between the informational and the biological, between technology and the body. New media, and computing in general also give us the notion of protocol, which in an increasingly networked world, becomes more important to understand, for it can shape the aforementioned boundaries and dramatically affect the organization of culture in new and profound ways. In computing, a protocol refers to an agreed upon standard or set of rules that enable connection, communication and data transfer in computer networks. The concept of protocol is at the core of network computing. In the network of networks, the Internet we have TCP, UDP, FTP and HTTP (the protocol behind the web), which are but a few of the protocols that govern the flow of data across it.4 For computers to be able to communicate over the Internet they must implement an entire set of protocols. These protocols, when taken together form what is known as a protocol �stack�, more formally referred to as the 7-layer OSI Model5. The implementation of these protocols are what allow communication to happen on the net. Thus protocol is fluid and flexible, expansive and autonomous. And it has the potential to reorganize the social, political and cultural landscape according to this dynamic. Much as the conoidal bullet fundamentally changed the methods and strategies of warfare8, the distributed nature of all networks, but particularly computer networks and (in the biotech century) biological networks, are fostering new organizational models of institutional power and control, namely distributed and autonomous control.9 Because of their very nature, the occurrences and enactions of these new models are difficult to locate or even describe. There is no one network of control but multitudes of autonomous yet connected self-organizing nodes that can enact their will and profoundly affect relations both within and between varied institutions, industries (military, science, media, etc) and individuals. This amounts to a new emergent framework of political and cultural organization. On September 15, 2001 the Radical Software Group (a group that includes Galloway) released Carnivore10. Simply put, Carnivore is an open-source surveillance software for data networks. It is a �packet sniffer�, a tool that monitors all Internet traffic (email, web, chat, etc.) on a specific local network. It then serves the data stream to �clients�. The client is usually designed to visualize, analyze or otherwise interpret the data stream. Carnivore takes it's name from a piece of software used by the FBI to perform electronic wiretaps. This software, which was recently decommissioned, was called DCS1000, but was more commonly referred to by its nickname �Carnivore�. Setting aside its role in the aesthetics of information, Carnivore, as contextualized by Galloway, can be seen as a form of conceptual art. Much like the work of artists such as John Cage and Sol Lewitt, Carnivore is a set of instructions that can be implemented at a later time. Of course this can be said of all software art (indeed of all software). What sets Carnivore apart is that it serves to reveal and take on issues of protocol head on. It takes a law enforcement tool and makes it available to all, especially artists. It can serve to reveal how power and control functions in the decentralized world of protocol, and how they can be subverted. It is undeniably a creature of protocol. It is protocol in action. As the ultimate target of most biotech research, the body currently occupies the turbulent boundary zone between the biological and the informatic. Thus, it becomes in a sense subsumed by the world of protocol, which brings up a multitude of questions about its place in culture. How is it affected as it is increasingly networked through information technologies and thus becomes more and more integrated with the world of protocol? Is the body itself emerging as a protocol? Or a protocological agent? Will the traditional distinctions and boundaries of the body still be useful in the future? Biology is evolving from a phase of discovery into a phase of creativity and utilization. The effects on society will be profound... The cybernetic notion of interfacing neurons with machines/robots is starting to become a reality. It is certainly a short leap of logic to look at this project and envision a world of programmable human flesh. But what does programmable flesh really mean? As Katherine Hayles has noted, the idea of the cyborg relies upon the concept of information as something separate from the material forms that give rise to it.16 Information is disembodied at its core. Intelligence is equated with the formal creation and manipulation of symbols and information patterns. These information patterns, it is believed, can pass unaltered from one material substrate to another. This is what is at the heart of most computer science research, and it acts as a potent force to continually efface the body and eliminate embodiment from digital technologies. As previously mentioned, biotech does not efface the body but seeks to materially alter or enhance it. Yet biotech research, much like computer science research, also believes that information can pass unaltered from one material substrate to another. Indeed, in the world of biotechnology the body expresses itself through information (in the form of DNA code, genome databases, protein sequences, etc.). How then would one interpret the workings of Fish & Chips, where information patterns are not abstract and disembodied but a material property of a hybrid techno-biological entity? Perhaps not (yet) intelligent but exhibiting signs of autonomy and self-organization, even at such a nascent state of development. Here, the information pathways sit uneasily between �wet� and �dry�. Not quite cyborg, since the silicon is not injected or fused with flesh but organically grown with it, rendering this entity's information generation and transmission as a property of its biology. What happens to this information then? Would it still be the same information if it were to be �uploaded� to a web server or personal computer � or human cells? Would any piece of information passing through something like this remain unchanged? Our cultural conditioning would lead us to say yes. In fact, Claude Shannon's Theory of Information formalizes this thinking, defining information as an entity distinct form the medium that carries it, with only the �noise� on the line serving to corrupt it.17 This thinking is at the heart of biotech research, where information is routinely passed between wet and dry. But intuition and reasoning may lead one to think otherwise. What then, do we make of Fish & Chips? Is it an �embodied� computer? Is it the digital word made flesh? The flesh made digital? Ultimately, Fish & Chips serves to highlight biotech's potential to enhance the biological and redefine the body (or at least the flesh) in its own image. Still biological, yet somehow something more. Like Carnivore, it is a material occurrence of the �totalizing control apparatus�, only this time it is biological protocols that are subverted for artistic ends. But Fish & Chips also demonstrates how the biological can serve to inform the world of the informational, to give information the body that it lost. In all of their work, SymbioticA confront us with actual physical glimpses of potential futures being made possible by biotechnology. They force us to ask ourselves if we are ready to deal with the consequences of our skills and knowledge in the life sciences. Their work is often provocative and controversial, some may even consider it audacious. In this sense, it is firmly seated in the artistic tradition of risk-taking and iconoclasm. It shows us things we would not otherwise see and asks uneasy questions that would not otherwise get asked. To put it another way, our knowledge of our own bodies seems to be shaped by the organizing and standardizing logic of Manovich's database and Galloway and Thacker's protocols. Schiphorst believes that our technologically determined culture (which values materiality over physicality) privileges its own definition of the technical, and thus has all but eliminated physical experience from its vocabulary. To reverse this trend, or at least make people aware of it, Schiphorst seeks to develop interactive art works that make participants conscious of their own physical processes and to have computer systems informed and influenced by these processes. Stemming from her background in both computer science and dance, much of Schiphorst's work, particularly The Whisper[s] Project, involves a desire to discover and map �data patterns� of the body.19 This is similar to what Eugene Thacker calls the identification of �patterns of relationships� that can be gleaned when moving between DNA �code� and computer code.20 But she also tries to bring an intimate and sensual aesthetic to her projects, something she feels is missing from digital media works. Although not necessarily a �bio-artist�, Schiphorst's work still shares some important similarities. First, she often works off the premise that the body can be expressed through information (�data patterns� of the body). 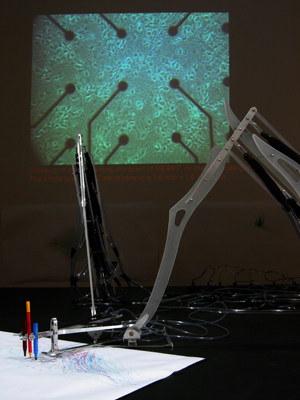 Like biotech, her work seeks to use the world of the biological to inform the world of the informational. Her work shows us how the body can indeed emerge as a protocological agent. Potentially helping to determine technological directions, rather than being determined by them. Certainly the analyses and artists presented here are intended as nothing more than a starting point for further discourse. Indeed, there may be more questions now than when this essay began. And perhaps that is the goal. The cultural and political realignments emerging from the collision of the protocological and biological arenas means that some deeply held concepts relating to life, biology and our bodies need to be reexamined. As the monitoring, regulation and production of bodies, and indeed life itself begins to function in a networked, protocological paradigm, the old familiar boundaries start to dissolve. Are we ready for this shift? How will we manage both the dangers and opportunities brought about by the joining of the protocological and biological? Will we recognize ourselves in the future? The perspective that can be brought to these questions by artists and other �non-experts� from the humanities may prove useful if we are to move forward with our eyes wide open. 1 Taken from Jeremy Rifkin's The Biotech Century: harnessing the gene and remaking the world (New York: Tarcher/Putnam, 1998). 2 While not directly referencing them, my notions of power and control (and those of many of the authors cited in this article) are, at least indirectly, drawing on the writings of theorists such Gilles Deleuze and Michael Foucault, among others. A lengthy discussion into their ideas is beyond the scope of this article, but for a quick sample that may provide some insight into how I am referring to these terms see Gilles Deleuze, "Postscript on the Societies of Control", from October 59, Winter 1992, pp. 3-7. 3 Lev Manovich, The Language of New Media (Cambridge, Mass: MIT Press, 2001). 4 For a more thorough technical understanding of protocols see Eric A. Hall, Internet Core Protocols (Cambridge, Mass: O'Reilly, 2000). 5 For a detailed explanation of the OSI Model, see http://en.wikipedia.org/wiki/OSI_model. 6 Alexander Galloway and Eugene Thacker, �Protocol, Control and Networks�, Grey Room 17, Fall 2004, p. 8. 7 Galloway and Thacker, �Protocol, Control and Networks�, p. 9. 8 See Manuel DeLanda, War in the Age of Intelligent Machines (New York: Zone Books, 1991). 9 For more on how power and control are changing due to the influence of protocols and the Internet see Alexander Galloway, Protocol: How Control Exists After Decentralization (Cambridge, Mass: MIT Press, 2004). 11 Eugene Thacker, �Data Made Flesh: Biotechnology and the Discourse of the Posthuman�, Cultural Critique 53 (Winter 2003), pp 72-97. 12 Galloway, Thacker; �Protocol, Control and Networks�, p. 16. 13 Galloway, Thacker; �Protocol, Control and Networks�, p. 20. 16 Katherine Hayles notes that the currently prevailing cultural belief is that information can move across different material substrates and still remain unchanged. She claims that there is a presumption of information as a �disembodied entity that can flow between carbon-based organic components and silicon-based electronic components to make protein and silicon operate as a single system.� See N. Katherine Hayles, How We Became Posthuman: Virtual Bodies in Cybernetics, Literature and Informatics (Chicago: University of Chicago Press, 1999), pp 1-2. 17 C. E. Shannon, �A mathematical theory of communication,'' Bell System Technical Journal, vol. 27, pp. 379-423 and 623-656, July and October, 1948. 20 See Eugene Thacker Biomedia (Minneapolis, MN: University of Minnesota Press, 2004).